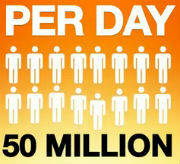 More than a year after Megaupload was shutdown by the feds the site still has millions of visitors every month. Even without content the defunct file-hosting site is among the top 2,500 most-visited websites on the Internet, and only sightly behind Kim Dotcom's new Mega. The baffling statistics show once again how enormous the site was. With a self-proclaimed 50 million users a day, MegaUpload was one of the largest file-hosting sites on the Internet. Last year the feds shut down the popular site accusing Kim Dotcom and six others of money-laundering and several copyright related crimes. While most of the site’s former users quickly spread out over other sites, visitors kept coming to Megaupload. Even today, more than a year after the shutdown, the site is still getting plenty of traffic. Based on the Alexa rank of 2,161 the site gets several million visitors a month. Quite remarkable for a site without content. The graph below compares traffic to the old Megaupload with Kim Dotcom’s new venture Mega, and shows that the two sites are awfully close. The above is a testament to the immense popularity Megaupload enjoyed. Most of the current visitors probably come from old links to downloads floating around the web. Others may check in occasionally for sentimental reasons, or hoping to get access to the files they stored on the site. However, these millions of visitors all leave disappointed. For the better part of the year the Megaupload domain has hosted a seizure banner. This banner appears to be gone completely now, but there’s still nothing to see. 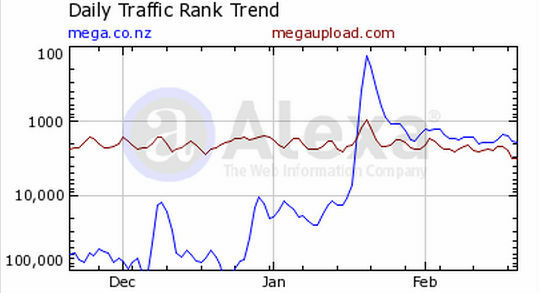 During the coming months Megaupload’s traffic will undoubtedly fade away. That is, unless the company is successful in getting the seizure warrants ruled unlawful, so it can take control over the domain again.